In my Undergraduate and MBA classes, I ask my students to create a 2 by 2 experiment using Facebook Ads. They are required to test the effectiveness of 2 messages or ads across 2 segments of consumers. I created this video tutorial to help them. Geeky stuff : I recently struggled to insert and autoplay a sound (or video) clip in a Qualtrics survey. It's eventually more complicated than it seems. Check out my method here. I was interviewed by Global News on our recent article published in the Journal of Consumer Psychology. Watch the video here, or click on the image. Pierre Chandon and I wrote an opinion article in the Washington Post, about our research on Football losses and unhealthy eating published in Psychological Science. Read the Washington Post opinion article here. Download the Psychological Science article here. I participated in the French Canadian radio show "Bien dans son assiette", on Radio Canada. I talked about my research on the relation between eating and well-being. Here's the link. I was recently interviewed by Julie Rose in her radio show "Top of Mind", on BYU Radio. 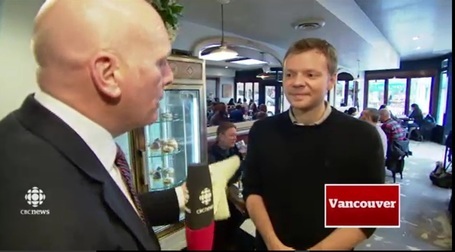 I was recently interviewed by CBC Vancouver about my JMR paper on sensory imagery and portion size choices. Yann Cornil, Assistant Professor of Marketing at UBC.